Palmeira Bodyworks is your local garage providing a range of expert bodywork services. 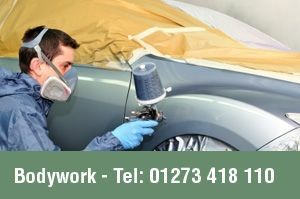 If you are looking for a bodywork specialist in the Brighton, Hove and Portslade areas, you have come to the right place. We offer a complete scope of garage services for bodywork repairs covering all makes and models of car, motorcycles, and small vans. Our professional team are on hand to undertake all maintenance and repair work to the highest standards. Need bodywork repairs? We’ll get your van, car, or motorcycle back on the road in no time. Using our extensive knowledge of bodywork repairs, we can conduct a thorough assessment of the damage and get straight to work fixing your vehicle. After so many years in the bodywork repairs trade, you can rest assured that your vehicle will be in safe hands with us. Why choose Palmeira Bodyworks in Brighton? Through our hard work, we have developed a strong customer base extending to Patcham, Falmer, Bevendean, Portslade, Shoreham, Lancing, and throughout Brighton. 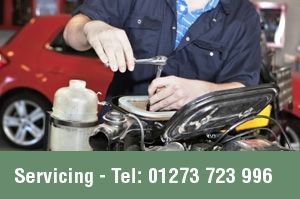 As car bodywork repair specialists, we can offer an efficient service that is tailored around your needs. No job is too small for our expert panel beaters and painters! From the second you call to book a repair service until you are driving away in your repaired vehicle, we will work tirelessly to give you best value for money. Need a garage in Hove? Looking for a bodywork specialist you can trust to carry out thorough and speedy repairs? Contact Palmeira Bodyworks today for a competitive quotation.